It’s winter in Pennsylvania… which means we could have snow, rain, mud or ice. In recent years, it seems that the heaviest precipitation ends up being rain and not snow. The good thing about that is that we don’t get buried under feet of snow. The bad… we can end up with lots of slush, or major puddles that later freeze into sheets of ice. A week ago, we had the coldest temps so far this winter with lows below zero and highs barely above. Sheets of thick ice and bumpy frozen slush. 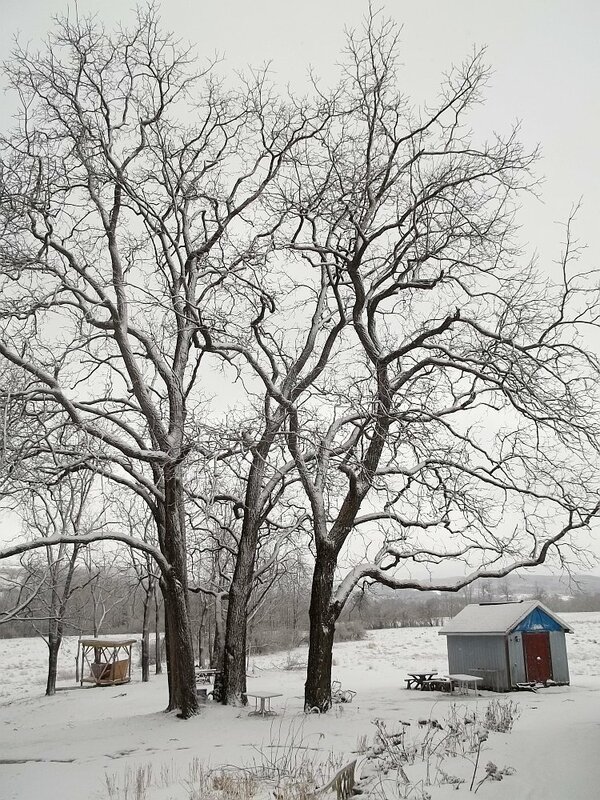 Now it is raining… all the snow we had is gone and in the place of the ice is a LOT of mud. 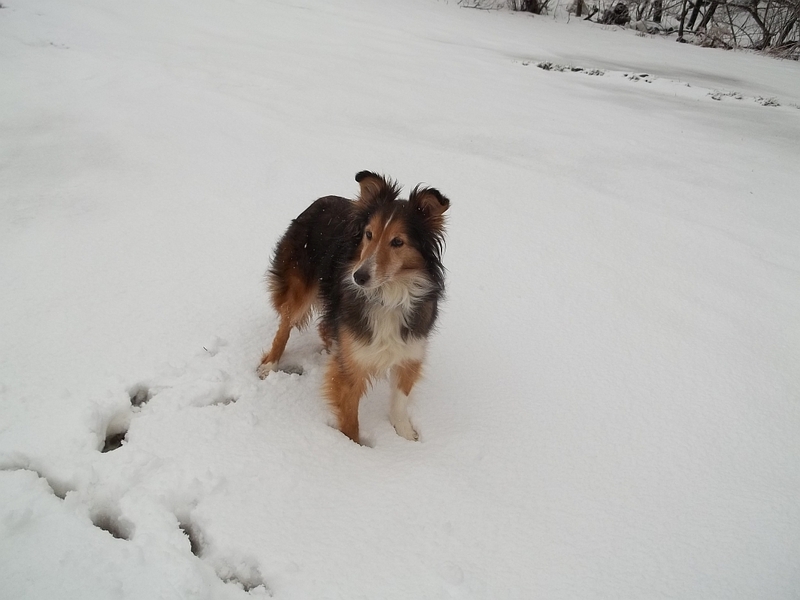 Bella appreciated the lowered snow depth after a meltdown of one of our big snowstorms, so she could run around again. She loves to chase squirrels and have the freedom of not being stuck to the shoveled paths. Now that things are muddy again, she really loves the outdoors to sniff out more critters. She also tracks a lot of mud inside for such little paws. 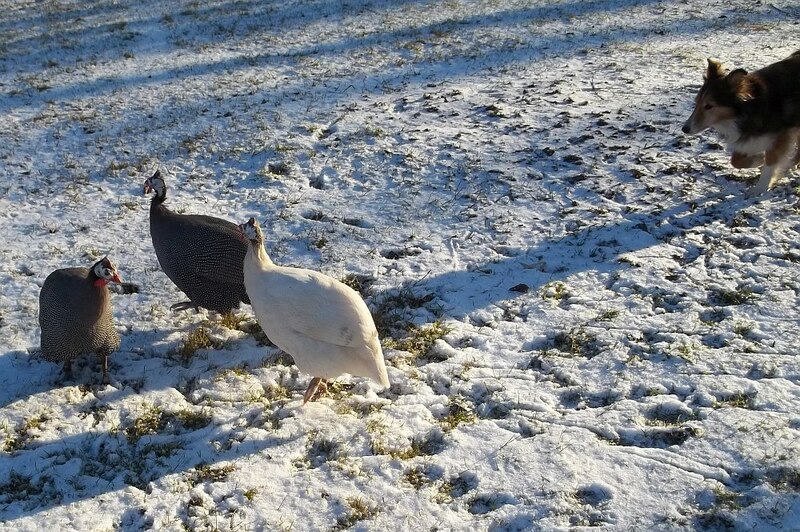 The Peeps (Guineas that aren’t so little, but still peep a bit) don’t care for the rain and mud… They will run about and pick at the grass when there is some snow. During the deepest snows and coldest days, they were left in their coop, so when weather is nicer, they enjoy their freedom. Bella looks as if she’s hunting them down in the above photo, but seems to want to play with them… they take turns running at each other. Since gardening outdoors is out of the question in winter, I have to get my “fix” playing with flowers indoors… on the computer for now. I did a design using some sketches I did for the latest Spoonflower challenge. The theme is a limited palette of coral, midnight blue, goldenrod and gray. All four colors were to be used, and unlike some limited palette challenges in the past, no black or white were allowed. A definite Challenge! The gray makes a good background color, even if it looks a bit dingy. 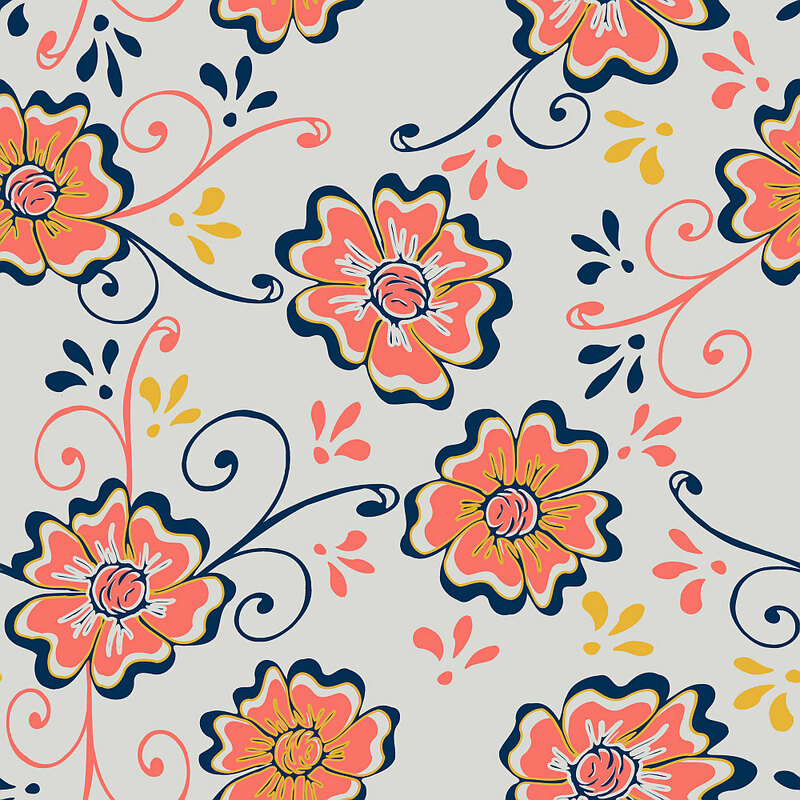 In the first few versions of the design, I tried the yellow in different areas of the flowers. After stepping back and looking at a mockup, I didn’t like that, so I took the yellow out of the center parts of the flowers. I like it much better now. So far I have only done one coordinating design, just using the swirls and splashes (or Fleur-de-lis). I hope to be getting these designs and others that I have done in the past months proofed so they can be available for purchase on fabric, wallpaper and gift wrap on Spoonflower. 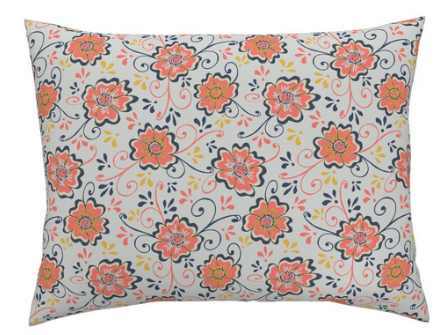 You can check out my Spoonflower Shop- AndrusGardens to see what is available now. I am up to well over 200 designs so far. In the month of February, I am participating in an Instagram sketchbook challenge. It is getting me to continue to do some things I would not have normally done. I will share some of those sketches in a future post. I am a former textile artist and new pattern designer with a degree in horticulture, wishing to share my love of nature, flowers and gardens with everyone through my photos, sunprinted fabrics, and now pattern designs. Chronic Lyme Disease has caused major changes to the direction my life. I have to limit the amount of time spent digging in my gardens, and quilting has become more difficult. 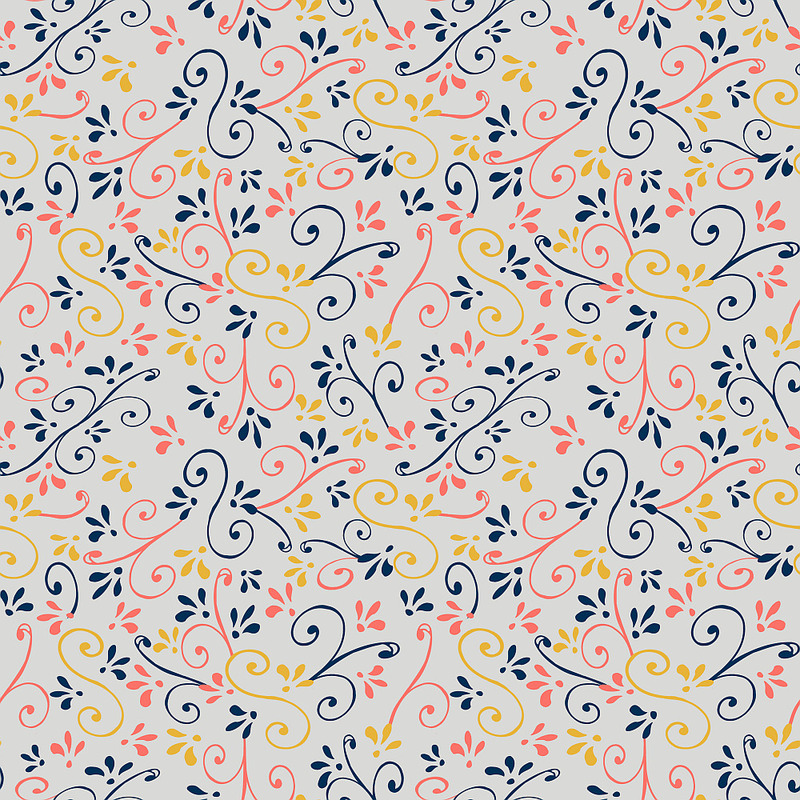 I discovered pattern design as a way to get art back into my life. 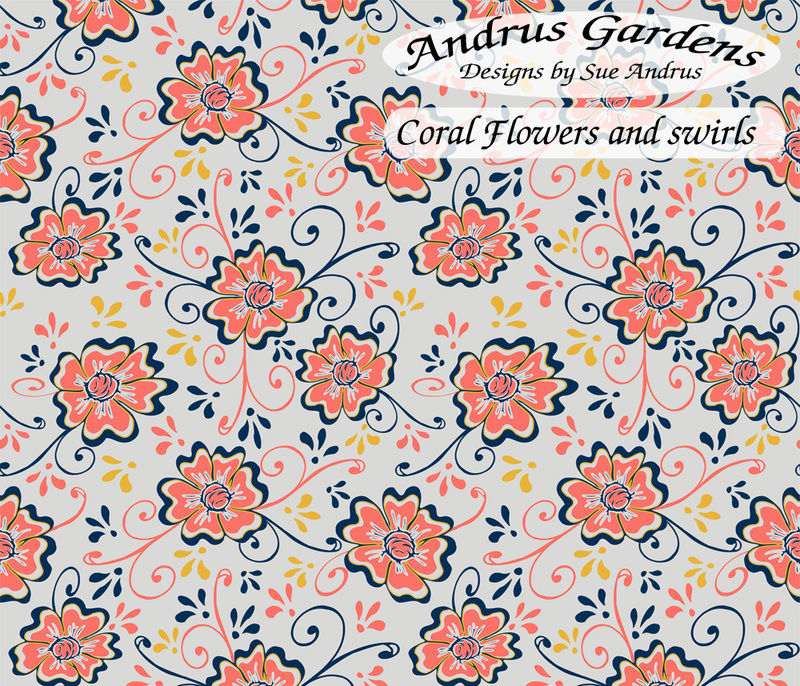 I now use my gardens and photos to inspire designs that can be used on fabrics and print on demand items. ‹ Getting Better at This??? I love to create beautiful art using flowers, gardens and my surroundings as inspiration. Formerly an avid Art Quilter, now a Surface Pattern Designer, re-learning how to live and be productive with chronic illness.